Why is an apple like a mountain? All things on earth are the shadows of eternal things that lie beyond the veil of matter. If we can see through a given material “fact” to the Truth that lies beyond, it will light our way to Eternity. This much we know. But let us consider specifics. Of what truth is a mountain the shadow? Of what Truth an apple? If the whole answer could be put into words, we should not be dealing with eternal Truth, but with mere mundane facts, for Truth is beyond the power of reason to grasp or of words to express. Only deep contemplation can reveal its fullness. Yet words can point the way, if we do not mistake the signpost for the destination. Every apple represents the golden apples of Avala; every mountain is a type of the Sacred mountain. Both are also symbolic of the Goal or Destination of the soul’s quest. In the case of the Mountain, the summit especially represents the Goal, although the mountain in itself has often been the focus of a pilgrimage, a symbolic enactment of the treading of the Way. Avala is sometimes called the "Earthly Paradise", for although beyond this physical world, it is still below the level of pure Spirit as the resting place for spiritually awakened but still imperfect souls. The Tree of Life, at its centre, bears the golden apples of life eternal. The word “paradise” comes from a root-word meaning “orchard”. Avala and Elysium both mean “apple-land”. 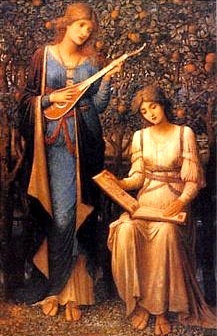 In many traditions, from the Sumerian and Greek to the Aztec, this paradise has been pictured as a mountain-top orchard which, in all earlier and most later accounts, belongs to a “goddess”. Thus the Sacred Mountain is Her mountain; the golden apples Her apples, for Hers is the gift of eternal life. The Sacred Mountain, whose summit is the paradisial apple-land, is effectively a version of the Way. The climbing of the mountain represents the upward journey of the soul. It has been called the Mount of Purgatory, for the ascent is in itself a purification. 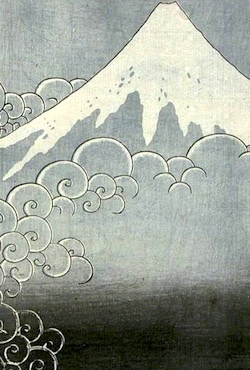 The mountain, with its layers or stages of ascent is an image of the cosmos, ascending through higher and higher levels of reality to the pure and absolute Reality. 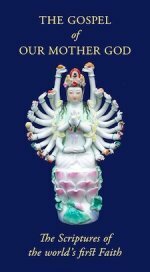 As in many versions of the Way, the divisions of the Sacred Mountain are seven, ruled by the seven planetary principles or the seven colours of the spectrum, and therefore by the seven great Janyati. In Norse mythology, the rainbow, Bifrost, reaches the dome of the sky directly over the summit of the Sacred Mountain, Himinbjorg, thus assimilating the Mountain Path with the Rainbow Path to Heaven. The Mountain Path is particularly appropriate for this symbolism, because it is a hazardous, narrow and challenging way. Furthermore, the most direct path upwards is generally the most difficult and accomplished by only the most proficient and determined, while others take easier but less direct routes. In the climbing of the mountain, there are often secondary “summits”, troublesome obstacles to overcome, just as In the journey of the soul there are minor victories over the false self to be won before further progress can be made. And in both, the factor which alone makes sense of and gives purpose to the whole is the existence of the summit, the Goal. Having ascended the Sacred mountain and reached the seventh, the highest, level, the climber breaks through onto another plane of reality, transcending profane space and entering a pure, sacred zone. This mystical experience directly parallels that of the dancer of the spiral on reaching the centre. It anticipates the breaking of the bonds of physical matter and the ascent into the celestial orchard of Avala. The Sacred Mountain is situated at “the centre of the world”, a mythic location which in part symbolises contact with the absolute Realities behind the veil of matter. It is here also that the Tree of Life and the Fountain of Life are said to arise. The vertical axis of the mountain runs through Heaven, Earth and Hell and forms a link between them. It is along this axis that travel between the three regions takes place. 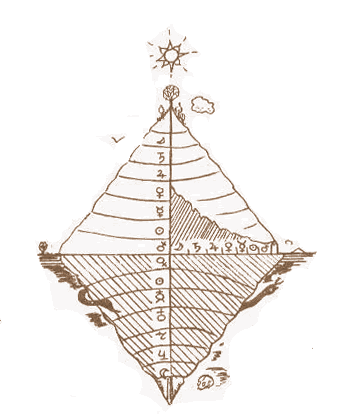 Diagram of the Sacred Mountain. The order of the Janyati may vary according to different symbolic perspectives. Here they are in the order of the Spectrum. More normal would be the order of the week — Candre, Vihke, Mati, Thame, Sushuri, Rhave, Sai Raya — a progression from the lunary realm immediately "above" the terrestrial to the Spiritual Sun Herself. Indeed, Sai Raya may be represented not as a level, but as the summit itself. The three regions of the axis each have their own path, and each path has seven levels, because the seven primordial Janya-principles are reflected in every phase of existence. The 3 x 7 pattern is re­capitulated in the Major Arcana of the Tarot; the twenty-one cards (excluding the nought card, The Innocent, which represents the soul herself) form a meditative pilgrimage along the axis, leading to the experience of realisation. We find the same symbolism in the twenty-one pylons of the Egyptian Book of the Dead. The apples of the Tree of Life — which, growing in the heart of Avala on the mountain summit, is at the highest point of the axis in the earthly region — are the fruits of this same realization. The axis of the worlds descends from the Tree of Life itself, for its great root forms the pillar of Hell on which the body of our Lady was hanged. This fact enshrines the truth that the golden apples of eternal life have their origin in the Divine sacrifice. This axis connecting opposites may also be represented by a straight line drawn diametrically through the circle of the year from the Feast of Divine Life at the Autumn Equinox to our Lady’s death and resurrection at the Spring Equinox; each the pivotal point of its own “world”, the first at the center of the Mysteries of Life cycle and the second at the centre of the Eastre cycle. 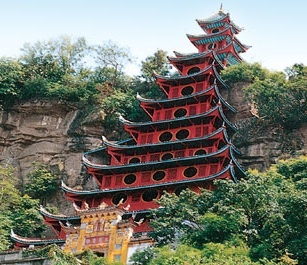 The Temple also shares the symbolism of the mountain as Centre and axis of the world. Many ancient temple forms represent the mountain with its stages of ascent — Babylonian and Sumerian ziggurats, the tiered, pyramidial Indian temple and the multiple-roofed pagoda are examples. All these forms go back to pre-patriarchal times. The ritual founding of a Temple re-enacts the Sacrifice of the Daughter, for the spiritual fruits of the Temple, like the the apples of the Tree of Life, have their roots in this Act. In patriarchal times, this degenerated into an actual blood-sacrifice — either human or animal — at the founding of a temple. This symbolism is also important when the Temple or Mountain is seen as a microcosm of the universe, for it is the Daughter’s sacrifice which makes possible the existence of the world in separation from the Absolute; and also opens the Way by which we may transcend it. While the mountain calls forth courage, unswerving commitment and the exercise of hard won skills from the climber, the apple, as representing the Daughter’s gift of life, provides both the context within which the struggle takes place and its reward. Thus the mountain represents the human activity in lifting the soul toward Avala and the apple the Divine grace or “action of heaven”*. Yet ultimately the distinction is Illusory, for even the human activity is only our participation in the Divine, since the whole universe flows from Her love. * We may here recall the Japanese distinction between 自力 jiriki and 他力 tariki — “own-power” and “other- [i.e. Celestial, or Boddhisattwic] power” in spiritual activity.